Curated category wise list of Best Smartphones in 2019. Check out our list of top 10 smartphones before you make a purchase. Last year, a lot of smartphones were launched with different designs, the different type of notches. Be it a water-drop notch or a notch-free phone, all brands were trying to stand out by reducing the bezels. 2019 is going to be a hit year for smartphone fans. Check out our curated list of best smartphones to buy in 2019 before you make a purchase. When you are shopping for a phone according to your budget, the list of phones is never ending! The list of top 10 smartphones we have compiled contains one of the best smartphones of 2018 as well as the latest upcoming smartphones of 2019. Check our best smartphones that suits your needs. Galaxy Note 9 has been Amazon’s Choice smartphone of the year. Although you can buy a bike or a scooter at the same price, features and specifications justify the cost of Galaxy Note 9. It comes with 12MP + 12MP dual camera, 6.4″ QHD+ Super AMOLED display, and 4000mAh battery. The base model features 6GB RAM and 128GB storage. It is powered by a powerful Exynos 9810 Octa-core processor. Bixby button can’t be remapped. Honor View 20 is the only smartphone with an in-display camera. Honor View 20 will be soon available in India. Pricing has not been declared by Honor team. Back of the smartphone has nanotexture with aurora effect. It has 6.4″ HD+ display, 6-8GB of RAM, 4000mAh battery. It is powered by Kirin 980 octa-core processor. iPhone XR comes with a 6.1″ HD retina display. It is powered by is powered by Apple A11 hexa-core chip. It comes with 64GB internal storage. iPhone XR packs a 12MP rear camera a 7MP selfie camera. Flagship smartphone created by Google comes with a 6.3″ QHD+ display. It is powered by flagship Snapdragon 845 octa-core processor and comes with $GB of RAM with 64GB internal storage without the option for expansion. Pixel 3XL has one of the best smartphone cameras till date. It has a 12.2MP rear camera with 1.4-micron pixels which ensure stunning image quality. OnePlus 6T could rank first on our list of best smartphones of 2019 but average battery life and issues in camera became a hurdle. It was one of the very few smartphones to come with the under-display fingerprint sensor. The phone comes with a 6.18″ Full HD+ display. It is powered by flagship Snapdragon 845 octa-core processor and comes with 6GB of RAM with 64GB internal storage for base variant. 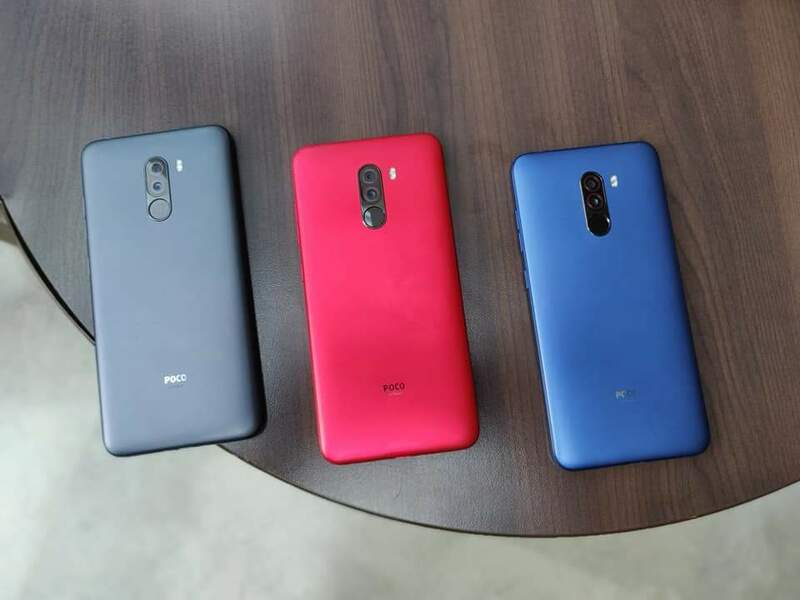 Poco F1 packs a 12-MP f/1.9 + 5MP dual camera setup on the rear and a 20MP selfie camera. Poco F1 runs Android 8.1 Oreo and is powered by a 4000mAh battery. Redmi Note 6 Pro has 6.2″ Full HD+ display. It is powered by Snapdragon 636 octa-core system-on-chip and 4000mAh battery. Base variant comes with 3GB RAM + 32GB storage and higher variant comes with 6GB RAM and 64 GB storage. It packs 12MP + 5MP dual camera setup on the rear and a 20MP selfie camera. Note 6 Pro runs on Android 8.1 Oreo. Redmi Note 7 has 6.3″ Full HD+ display. It is powered by Snapdragon 660 System-on-chip and 4000mAh battery. Base variant comes with 3GB RAM + 32GB storage and higher variant comes with 6GB RAM and 64 GB storage. Note 7 packs a 48MP + 5MP dual-camera on the back and a 13MP selfie camera. Redmi 6 Pro comes with 5.84″ FHD+ display. It is powered by Snapdragon 625 system-on-chip and 4000mAh battery. It comes with 4GB RAM + 64GB of internal storage. Redmi 6 Pro features 12MP + 5 MP AI dual camera with large 1.25μm pixels and a 13MP selfie camera. Liked our curated list of Best Smartphones? We hope that our special article of best smartphones to buy in 2019 will help you choose your next best smartphone. Be it Android or iPhone we gave our best efforts to cover smartphones which were the overall complete package and were having a good battery life, great camera, great display, and good performance as well.